Paw Patrol Chase on the Case Dark Navy Cotton Fabric. 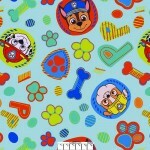 This fabric is great for quilting, sewing, cra..
Paw Patrol Favorite Pups Navy Cotton Fabric. This fabric is great for quilting, sewing, craft, and h..
Paw Patrol Mission Pawsible Navy Cotton Fabric features the Paw Patrol Pups with paw print, dog bone..
Paw Patrol Paws and Spots White Cotton Fabric. This fabric is great for quilting, sewing, craft, and..
Paw Patrol Pup Pals 4 Ever Flannel fabric. 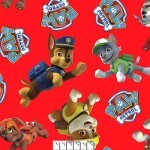 This fabric is great for quilting, sewing, craft, and ho..
Paw Patrol Pup Power White Cotton Fabric. This fabric is great for quilting, sewing, craft, and home..
Paw Patrol Rainbow Skye Glitter Cotton Fabric. This fabric has glitter in the rainbow and is great f..
Paw Patrol Recue Car Blue Cotton Fabric. This fabric is great for quilting, sewing, craft, and home ..
Paw Patrol Rescue Badges White Cotton Fabric. This fabric is great for quilting, sewing, craft, and ..
Paw Patrol Marshal Chase Rocky Toss Plush Fleece. This is a soft to the touch short fleece fabric..
Paw Patrol Pups Toss on Red Fleece. This fabric is great for no-sew blankets, sewing, craft, and hom..
Paw Patrol Pupstastic Dream Team Aqua Fleece. This fabric is great for no-sew blankets, sewing, craf..
Paw Patrol Shields Blue Fleece. 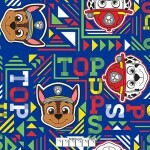 This fabric is great for no-sew blankets, sewing, craft, and home de..
Paw Patrol Top Pups GEO Plush navy Green Fleece. This is a soft to the touch short fleece fabric..